I plan on addressing the extruder banding problem by replacing the entire extruder assembly, but first I'd like to investigate the source of problem for the sake of completeness. Regularly spaced patterns are often produced by rotating components. This is because rotating components such as bearings, pulleys, or motors spin continuously (leaving a defect behind at each interval) whereas a defect in a linear guide will only affect the printer at one location. 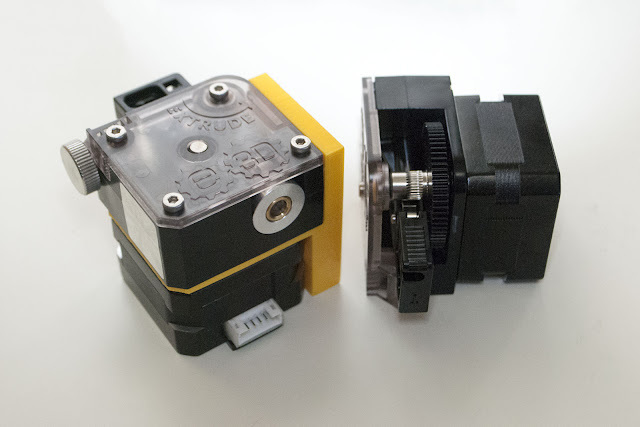 The two likely culprits within my Bulldog extruders are the stepper motors and the drive hobbs. Patterns produced by the stepper motor will occur at multiples of its step angle, and patterns produced by the drive hobb should occur at either a full revolution of the motor (off-center) or at each tooth (bad geometry). We can therefore determine the exact source of the error by measuring the spacing of the pattern. 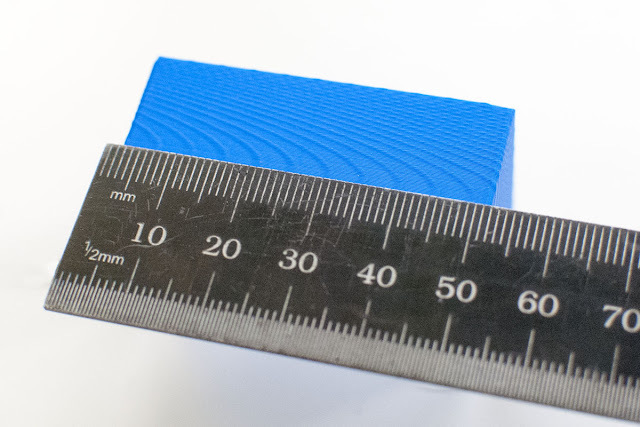 The ridges on my test print are spaced somewhere between 4mm and 5mm apart. I'll call it 4.6mm for convenience. Don't worry too much about the math, what matters is that the patterns in my test print are being caused by an error that repeats every 0.15mm of filament. My first thought was the the teeth of the drive hobb were not pushing the filament evenly, but as you can see the drive tooth indentations are spaced much too far apart to explain the patterns in the test print. This perfectly matches the expected 0.15mm calculated earlier, and virtually guarantees that the stepper motors are the culprit. 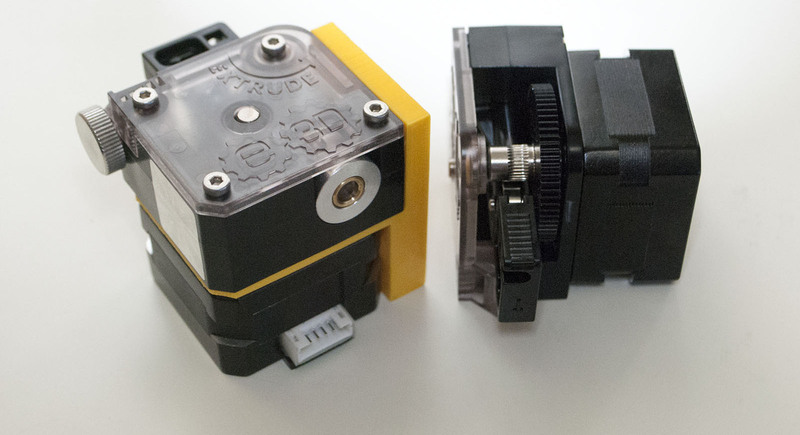 The blobs are occurring once every full step of the motor. I was quite surprised to learn that the stepper motors were the cause of this artifact since normally stepper motors perform quite linearly when micro-stepping. I can only assume that that I got a particularly bad brand or batch of motors. The simple fix would be to replace the stepper motors with a more reputable brand, but I've been thinking of swapping to E3D Titans for some time now and this is a perfect opportunity. 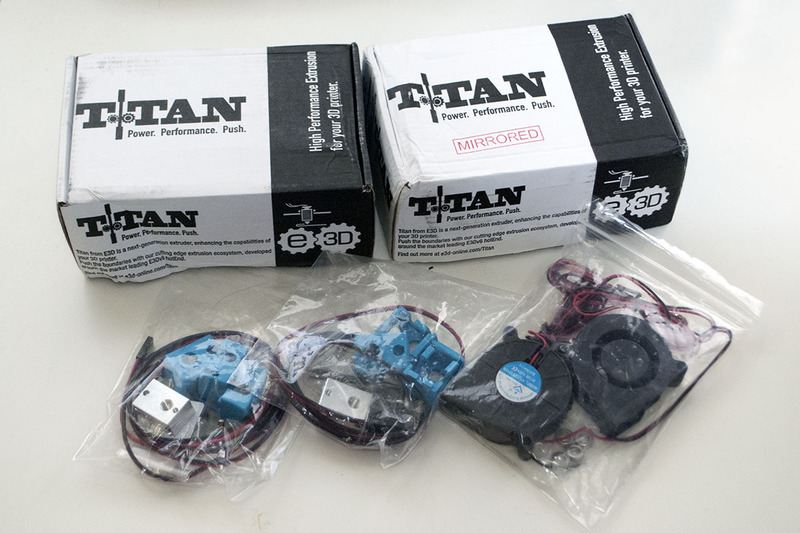 Compared to the existing Bulldogs, the Titans are lighter, more precise, and easier to use. The Titan is a very clever design, and they have gone to extreme lengths to keep it compact. One of the mounting screws runs through the drive gear shaft; the idler pivots on the motor shaft and slides against the gear as well. 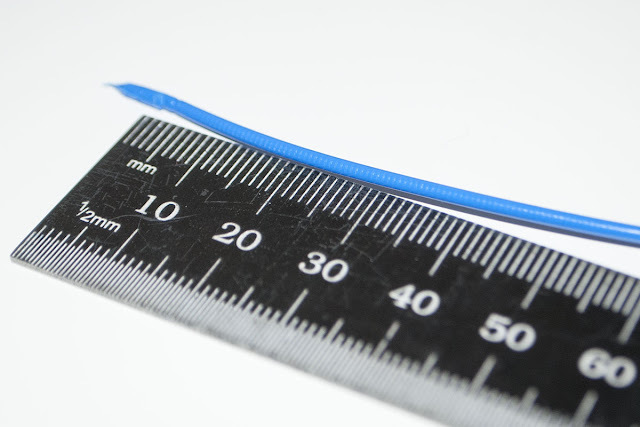 A major advantage of this design is that they are able to fit 3:1 gear reduction into a device that is similar in size to a typical direct-drive extruder. I'm trying to fit two of them next to a Chimera so the efficiency is welcome. I also picked up block and sock upgrades for both extruders and a pair of blower fans for the eventual cooling shroud. The E3D Titans have a different form factor and mounting arrangement than my original Bulldogs so the upgrade will require some work. I plan on first mounting a single titan to check that it fixes the extruder banding, and then using the single Titan to print a complete dual extruder conversion with cooling shroud.